This is a great video made by a guest of ours! Some of the clips are taken in our rental skiffs and some are in the up-grade rental boat, probably from the previous year. The Salmon King is Jim and the video man is Jim’s brother Bryan! Thanks guys! Thanks again for another great week in Alaska! Your hospitality is always top notch and personal. The little touches are the things that keep us coming back- being able to smoke salmon while we are there, crabbing, ocean fishing or river fishing, grilling oysters. And no matter what Mike told you Trish, the raspberry pie was to die for-perfection! Thanks for all you so to make the week a success. I just want to thank you for an outstanding experience on my first trek to hunt Alaska. For a do-it-yourself hunter, your facilities and staff are absolutely perfect and provide just the level of attention needed to have an enjoyable trip, but with plenty of room to “figure it out myself!” From the truck, to the cabin and the meat processing facilities, everything was absolutely first class and made the logistics of travel all the way from Virginia and back absolutely painless (with a little more freight on the way home too)! I spend a lot of time in the fields and marshes of Virginia, and I have been blessed to hunt in some pretty neat places all over, but everything I have seen so far pales in comparison to Prince of Wales Island. What a majestic landscape and wonderful culture! I was honored to hike its grounds and harvest a pretty awesome animal. I can assure you my hunting partner and I will be back, next time with our wives. They have had to hear so much about it since we got home that they are ready to join us next time! On the flight home, Kathy and I decided our trip to Adventure Alaska was the best vacation we have ever taken! It is not often you can say your expectations were exceeded. On this trip, they were! The accommodations, vehicle, and equipment were first-rate; the fishing and deer hunting were outstanding; and the weather (which I am fairly certain you can’t control) was incredible. Beyond that, you and your staff were genuine and pleasant. Our time there felt more like staying with family or friends rather than being a “customer”. Our questions were always answered with a smile and you took time to make sure our trip was one to remember. Our vacation with Adventure Alaska was so wonderful we have booked again for 2015 and will be bringing my son and daughter to experience Prince of Wales Island and Thorne Bay. My brother and nephew, as well as Kathy’s sister and brother-in-law, will also be joining us. After hearing about our trip, they were not about to pass up an opportunity to come with and see it for themselves! We look forward to seeing you again soon and thank you for everything. This was my first trip to Alaska and I have to say it was one of the most enjoyable experiences I have had on any trip, for hunting or otherwise. We were met at the float plane by Jason and driven up to our awesome condo with all the amenities of home. There was not one discomfort or time when I wished I had something more. Everything from the facilities to the gear was top notch and in excellent condition. We set our crab pots with our skiff, drove our 4×4 all over the island in search of bear and deer and relaxed in our comfortable condo each night after our long hunting days. My hunting partner and I were lucky enough to draw 2 black bear tags and we purchased deer tags. By the third day we were zeroed in on the bears and we both tagged out by our 4th day of hunting. We decided to begin fishing and deer hunting in the afternoons. We caught some delicious salmon and dungeness crabs every day for dinner and chased the bucks in the alpine areas of the island. We did not fill our deer tags but we had an awesome series of deer hunts and the scenery was amazing. We are already talking about returning to deer hunt in 2015 and we can’t wait to see everyone again. Thank you all for an excellent experience. Jason- a couple of photo’s from our trip that Tony took, if you are interested. We really enjoyed our stay at your lodge. The ‘cabin’ is more like a home. It was spacious and new. The full size truck you assigned to us was in like new condition. Everything was clean and in great shape. You offer a nice set up- everything we needed was either on hand or a short drive to the store in town. The fishing was great. We were easily able to get to good spots in the 16′ skiff. Next time we will reserve your bigger boat to explore further. I was surprised to see how nice your halibut and salmon rods are. We really did not need to bring up our own. Your tackle store makes it easy to put down the gear that will work. We ate like kings every night: salmon, halibut, crab. It was hard to leave. Tom and I want to thank you for providing an unbelievably refreshing vacation haven. We’re so fortunate to have chosen Adventure Alaska. By the way, when we stayed at the Klondike RV Park in Soldotna, AK, for 7 days, we told the owner about how great your place was. So now I’m telling you…he runs a super place, too! Just wanted to take the time to thank you both for another GREAT time and trip to Adventure Alaska. Everything was perfect again! It was my step brother Richard’s first time in Alaska and his first bear. To see the smile on his face everyday was priceless What a great way to pay him back for getting me started in the hunting world, some 35 plus years ago. He was not disappointed and can not wait to come back! As for myself, it was my largest bear ever. He is over 20 inches and perfect hide. We saw something new everyday. I am still falling in love with Thorne Bay and the people that live there. Thank you so much. I will see you again, Hopefully with my wife Debra on her first trip to Alaska, as we look for a lot in Thorne Bay to build on someday. I cannot thank you and your staff enough. May God bless you and your family with favor always. Thank you very much again for your warm hospitality. We all had a remarkable time during our stay. Your fully equipped facilities made us enjoy our trip much more. And, it is always good to meet with the nice people like you & your family. James was also nice and helpful. We would not hesitate to recommend your place to our friends and family. In fact, some of our friends and family members already ask us to organize another fishing trip at your place. Therefore, yes, it is a big chance that you will see us again. Although it will be our third time at Adventure Alaska, I am sure we will still enjoy it very much and more feel like home. By the way, please do let us know if you come to Hong Kong or Shanghai(China). We would love to show you around. Please send our warmest regards to your children. Thank you for your hospitality while being your guests. Adventure Alaska Southeast’s family and employees are all wonderful people. Though my husband had stayed with you before, I had not, and my expectations were surpassed! Your lodging is top notch and the hunting and fishing was amazing! Where else can you spend a week with such great people, have a nice truck and boat, harvest two 20″ black bears, see amazing whales up close and personal while in the boat, canoe, and take in all the beauty of Alaska? We highly recommend your establishment to anyone! Thanks again for a wonderful week and we will see you soon! I just wanted to take a moment to thank you both (and James & Rita too) for providing a top notch place for me and my crew to stay while Hunting Bear in Alaska. I was very pleased with the Cottage and the Equipment and amenities. Your facility and people really turned a vendor/customer trip into a once in a lifetime hunting experience that all of us will remember fondly the rest of our lives. There wasn’t one us that wanted to leave and everyone was as excited about the trip going home as when we were leaving for Alaska, and that is very difficult to pull off. Thank you for a wonderful week at Adventure Alaska. I could not have picked a better venue for my first ever hunting trip. Everything was great, from the initial orientation by Trish to the final trip to the plane by Jason. The total experience was unforgettable, getting my bear was just icing on the cake. I will recommend Adventure Alaska to all of the hunters I know. Once again, Thanks! We had a great trip with you and Jason and definitely will return ! I have made several trips to Alaska over the years and stayed at different lodges/camps-yours is by far the best of the best ! I have given your brochures to two of my customers who are planning Alaska next year. Will definitely continue to be your unofficial local sales force ! Thanks so much for making my first Alaskan fishing week truly an adventure! The manner in which you familiarized all 14 of us with your equipment, transportation–boats and vehicles, services, facilities, and daily updates of fishing locations was truly the mark of professionalism. I’ve been lots of places during military deployments throughout the world but never welcomed as you & your staff did for us 20-27 August 2010. Especially noteworthy was your daily availability to all departing groups each morning, regardless of the hour. I had heard many laudatory comments reference your operation but was totally blown away to see my expectations greatly exceeded! Best to you & family and thanks again for the great support. We would like to thank Trisha, Jason, Jory, James, Rita, and Amy for making our stay in Alaska one to remember for a long time. Enough cannot be said about the accommodations at Adventure Alaska and the friendly people of Thorne Bay. For many of us this was our first trip to Alaska and truly a learning experience. Your website was very helpful in preparing for the trip. Good rain gear is a must. We were greeted at the pier by Jason even though we were early and things rolled smoothly from there. Everything from room and board to the Lund boats equipped with 4 stroke motors and GPS speaks to your professionalism. We chartered the Alpha & Omega and Jory treated us to some very fine fishing (see pics). 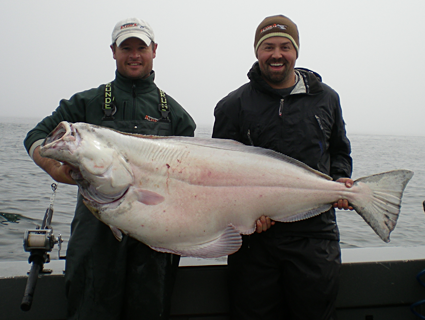 I had a huge halibut on and managed to get it close enough to see before it decided it liked the bottom better. The day was complete with a scenic ride home including whales playing in the kelp. I caught the 3 largest fish of my life in the matter of just a few hours. We found everything we needed in the tackle shop equipped with anything from halibut jigs to the tiniest of flies for stream fishing. All of our fish were cleaned, vacuum packed, and frozen for the flight home. I will definitely be seeing you all again next year in hopes of landing the grand slam of Southeast Alaska fishing with a few salmon thrown in for good measure. My recommendations started on the flight home from Ketchikan as I was sorting out pictures and had given your website to several people by the time we made Seattle. Thank you for all you did for us to make our recent visit to Thorne Bay very enjoyable. Our charter trip aboard the Alpha & Omega was successful due to Jory’s commitment to satisfy. On a day that Mother Nature threw some very nasty weather at us he put us into a limit of Halibut in calmer waters and we also had some bonus rockfish. Jory also shared some great advice with us when I asked him about fishing the Thorne River as that was our plan for the next day. Not only did he make tackle suggestions for both fly and spin fishing, he also told us about some good locations to try. We used that information to hook several fish the next day including the the one in the attached photo. The way you set us up for our last day of fishing the saltwater of Thorne Bay with skiff and gear rental was the perfect finish for a wonderful trip. Even though we had no offshore rods or tackle you helped us with everything we needed (even to the extent of a dot on the map) including the right tackle and techniques even how deep to fish. We turned that advice into a 13 Salmon day that will always be a special day in our memories. We hope to return for another trip of memories in the future.